When we talk about quotes, we often think about movies and imagine real life successful people. Have you ever thought that there is something that you can learn from fish? When Pixar launched Finding Nemo in 2003, 13 years ago, it grossed $339 million and became one of the best Pixar films that time. This year, 2016, Pixar did another spectacular result through the launching of Finding Dory, the sequel to Finding Nemo. Instead of naming it Finding Nemo 2, Pixar chooses to name it Finding Dory because the story is about Dory’s quest to locate her family. I love the movie, and I mean both movies. They are very entertaining and insightful. So, decided to create a quote post on these two movies. If you haven’t watched the movie, you must because these are great movies that you cannot miss out. If you have watched the movie, you will know that Dory suffers short-term memory loss. She cannot remember a thing and tend to forget it after a short moment. 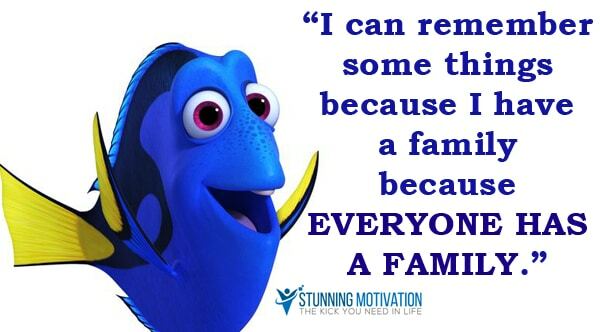 And when Dory said this line in the movie, it hit me by making me think about my family. Everyone has a family. And success will always start from home. You were born into this world today because of your parents. No matter what they have done, you should forgive them and treat them well. They are the reasons you exist in this world. When you have a family, you will be more responsible and be more committed. Whatever you have with you, you must learn to use it wisely. 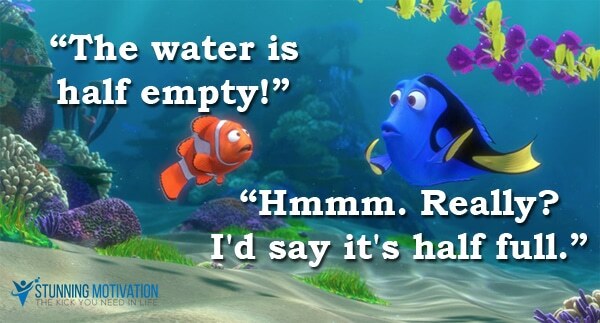 Just like when Dory forgot things and did silly things, Marlin got angry and shouted this line at her. 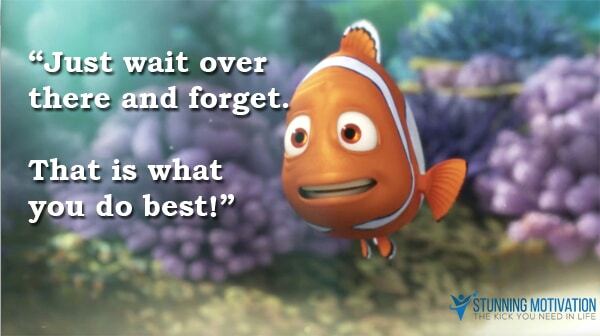 Dory’s short-term memory can be both a good thing and a bad thing. It is good because she forgets easily. She will never hold grudges, and she can forget all her pains. It can also be a bad thing because she forgets the danger and swim through the vast sea recklessly and cause troubles. No matter whether Dory likes it or not, it is part of her. She cannot get rid of her short-term memory problem; she has to learn to live with it. The same goes for us. There are things that we just cannot change. If you are a fish, learn to swim, but if you expect to climb a tree, you will waste your life thinking why you are so lousy at it. This is one of the best and famous quotes from the movie. When life gets you down, what should you do? Just keep swimming. Just keep swimming. Remember, when things get tough or when you are facing difficulties in life, just keep moving forward because if you stay stagnant, nothing is going to change. Unless you continue to move forward, you can never make a change. 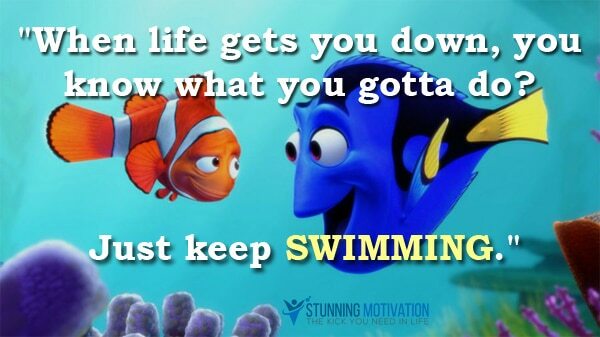 So just keep moving forward and keep swimming. In the movie, when times get tough, Nemo will often ask himself, “What would Dory do?” The reason is that Dory always knows what to do because she always forgets and dares to do crazy things. Use your imagination and ask yourself what would your favorite gurus do? When you ask yourself this question, your mind will search for solutions and get the most related answers to help you in your tough situation. 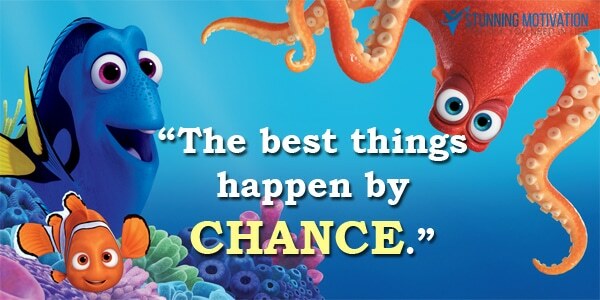 Yes, the best things happen by chance. If you have expected something to happen, there will be no surprise for you. In life, the best things are those that happened without your expectation. I visited Korea early this year in February, and when I checked, most websites gave me the information that late February will not be snowing because the weather will be entering spring soon. To my surprise, the second day when I was in Jeju Island, it snowed, and I was so happy and delighted. I have expected it to snow, and it was my first time experienced the chill weather. Yes, the best things in life happen by chance. So do the unexpected and dare to venture beyond the norm. And you will get a big surprise – Success! Everyone knows that undertow or rip current is dangerous, but because Dory has a short-term memory, she forgets it and thought that the undertow is something fun. This explains why babies are not afraid of something hot or fire. When babies see a cup of hot water, they wanted to touch and grab it because they are curious about it. After learning the lesson that hot water is dangerous, the baby will never want to touch it anymore because he has conditioned that hot equals pain. In life, many people have conditioned that running their own business as something dangerous and they never dare to take the opportunity. This is what stops most people from chasing their dreams. They are afraid what if they fail and that things are just too difficult. 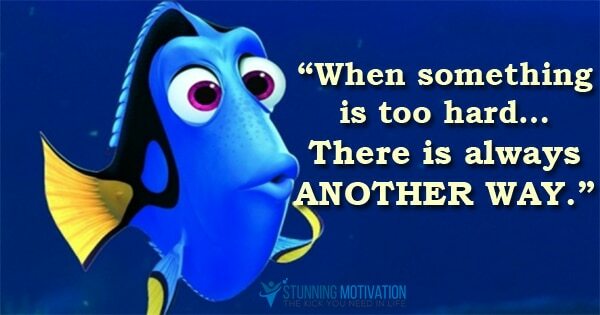 Sometimes, we have to be like Dory, just forget about the danger and take a leap of faith. Of course, I’m not asking you to swim with the undertow or rip current in the sea. All I’m saying is that you should take more chance and make more mistakes in life. It is alright if you fail, take it as a lesson and learn from it. 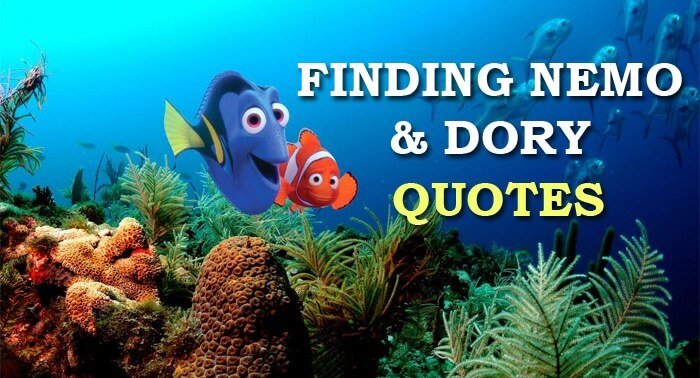 Dory often lost her way home because she tends to forget. So her parents would line up shells that led her home. So whenever Dory sees the shells, she would just follow the trail and she will be home. And her mother, Jenny, once told her that this means she can do whatever she puts her mind to. Yes, you can achieve anything you want when you put your mind to it. Just focus and never get distracted. 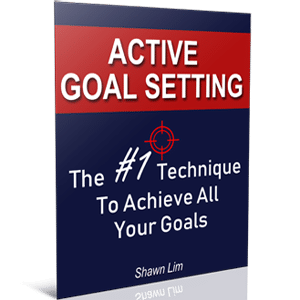 Put your thoughts on the target that you want and have a laser-focused on it, like an arrow, you will be able to achieve whatever you want. When you are determined, and when you have a laser focused, nothing can stop you, except you. Most people are not living the life they want because they are afraid to take action, and they do not dare to dream. Do not let this happen to you. Even a fish knows the power of its mind. You can accomplish amazing things if you put your mind to. Bruce, the shark, knows that if he wanted to change his image as a shark, he must first change himself. And this is very important if you want to be a successful life. Most people say that they want to be successful, but they are not willing to change themselves and their image. They say that they want to build a multi-million dollar business, or they want to start a successful internet business, but when they get back home, the first thing they do is to check updates on Facebook for fun or watch TV. They are not holding the image as a successful entrepreneur, no wonder they are not successful. Never let this happen to you. You must first change your image and change yourself. If you say, you want to build a successful online business, change your image and act as a successful internet entrepreneur. If you want to be a successful writer, change your image and do what a successful writer will do. If you want to be successful, you must first change your image and act like a successful person. It does not matter if the water is half empty or half full. It can be half empty if you look at it as half empty. And it can be half full if you look at it that way. Two people can read the same book; the first person does not believe in the principle and never do anything about it. The second person chooses to believe what the book teaches and take action. The first person who never take action, never improve his life and everything remains the same. Conversely, the second person who takes action produces results and improves his life. Therefore, it does no matter if the water is half empty or half full, all that matters is what you choose to believe. So choose to see something good and believe in yourself. If you think that you can do it, you will do it. If you choose to believe that you do not have the potential, and it is not possible for you, you will never do it. You become what you believe. Period. Sometimes it is difficult to explain things, and you just need to follow your heart. When something is right, you will know it from your intuition. The same goes when something goes wrong, you will know because you can tell from your instinct. Successful people practice their intuition and follow their hearts. Sometimes, some things are just cannot be explained, but you have to follow your heart and do what you feel is most right to you. Steve Jobs started Apple, and Richard Branson started Virgin Airlines, they have no idea how their businesses will turn out. They just choose to believe and follow their hearts. If you are a Steve Jobs fan, check out my best quotes from Steve Jobs here. 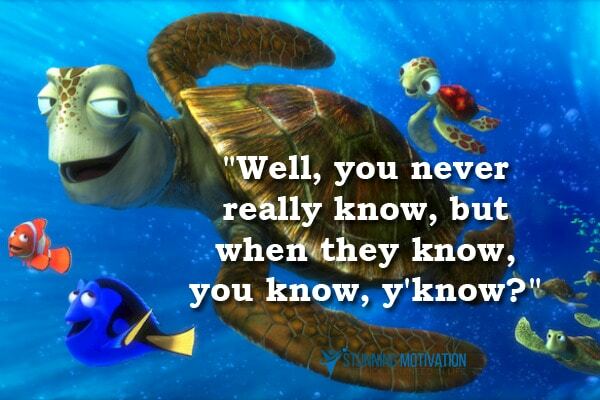 Dory said this line when she and Marlin got lost in the first movie, Finding Nemo. When you are lost, remember that you are not alone, and there is always someone out there who can help. The ocean is huge, but even then, Dory believes that she and Marlin are not the only two there. There are other fish that can help them. This is true in life. The world is big, and you are not alone. When you face difficulties and tough times, remember to get help from others. Colonel Sanders, the man who revolutionize the fast-food industry with his Kentucky Fried Chicken recipe, knows that there will be someone who will appreciate his secret recipe. Colonel Sanders got rejected for more than a thousand times, but he continued to search for the right guy to say ‘Yes’ to his deal and eventually found it. Remember, this world is big enough that there will be someone out there who can help you, but you must first ask for it. You are not alone; help is always there if you are willing to search for it. Sometimes you just need to be like Dory, forget what hurts you. When you have no memory, you will have no problems. Hank, the octopus, seems to be a very pessimistic guy with a lot of problems. And when he meets with Dory, he understands that all his problems are within himself. His memory and his thoughts are the ones that created all his worries and problems. You have to understand that worries and problems are there because you think about them all the time. You can choose to focus on the solution or to think about the problems. Everyone has their problems; the only ones without problems are dead people. If you are broke and in debt today, you have financial problems. And when you make it and earn a million dollar, trust me, you still have problems, but different ones. No matter if you are young, old, rich, poor, educated, uneducated, work as an accountant, admin, a teacher, a homemaker, a boss, a business owner, etc., everyone has problems to settle. Problems are everywhere, as long as you exist and still live in this world. The key is not to run away from your problems, but choose to focus on the solution and handle them. When the rain comes, instead of complaining about it, learn to dance in it. This quote is powerful, and you can see how the fish turn the impossible event around in the movie. Just find a way to solve your difficulties at hand. Sometimes you may feel hopeless, and there is nothing much you can do, but if you think about it carefully, you will find a creative solution. You just cannot see it at that time because you are too stuck up with thinking about the problem. Just get yourself out of the situation, stay calm and think of the solution. Try to look at the situation as an outsider, think from a bigger perspective and be creative. If you like the quotes shared here, remember to SHARE through social media and lighten up others too. Do share with me which quote resonate with you, and which one you like the most? By the way, if you got inspired by this article, check out my Kung Fu Panda quotes too! I’m surprised the quote “Just keep swimming!” isn’t on this list. Hi Russell, isn’t on #3?? Good stuff guys big up….can you make one for Trolls? Hi Simon, Trolls? I didn’t watch, so I can’t really come up with one for it, for now. i loved it. 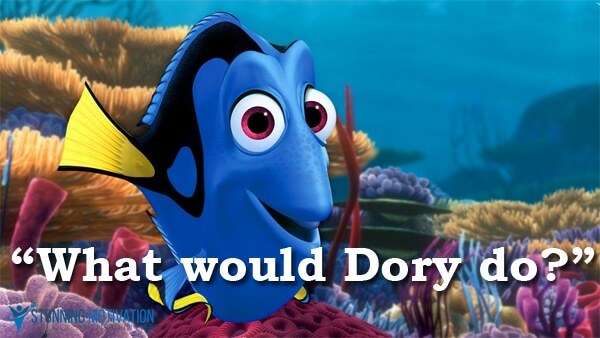 i would like to add “dory is your heart” when in trouble ask yourself “what would dory (your heart) do”. you would get the best answer and then simply follow it without fear.